The state takes a big step forward in the use of renewable energy sources. 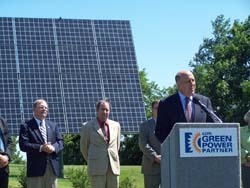 Governor Jim Doyle has announced plans for the state to purchase 92,400 megawatt hours of electricity produced by renewable sources, enough to power nearly 10,000 homes. The electricity will be used to power state facilities and university campuses. Doyle says the move will also off-set carbon dioxide emissions in the state by more than 156 million pounds, the equivalent of taking over 13,000 cars off the road. The purchase is part of an overall plan to have the state get 20-percent of its power from renewable sources by the year 2011. The state will spend an extra $1 million to purchase the renewable energy. However, the Governor expects the investment to pay off over time, with costs going down over the next decade as more people turn to renewable energy. The electricity will be purchased from Madison Gas and Electric, We Energies, and Wisconsin Public Power Incorporated.